Amaysim responded rejecting the claims. The matter is now before the Federal Court, with ACCC looking to penalize Click Energy for the alleged breaches. Amaysim paid $120mil for Click Energy in 2017 as a part of the company’s push “to become the “remote control” for the smart home” – taken from the media release following the acquisition. At the half year result, Click contributed more than half of the group’s EBITDA. If found to have breached marketing laws, Amaysim will likely pay a sizeable fine, but also may be required to allow customers who signed up based on the material the ability to exit plans with no fees. Given Click Energy is integral to Amaysim’s plan of vertical integration of products into a customer’s home, the effect could be multiplied as customer’s remove themselves from other Amaysim products – not to mention the reputational impact to go with an ACCC breach. 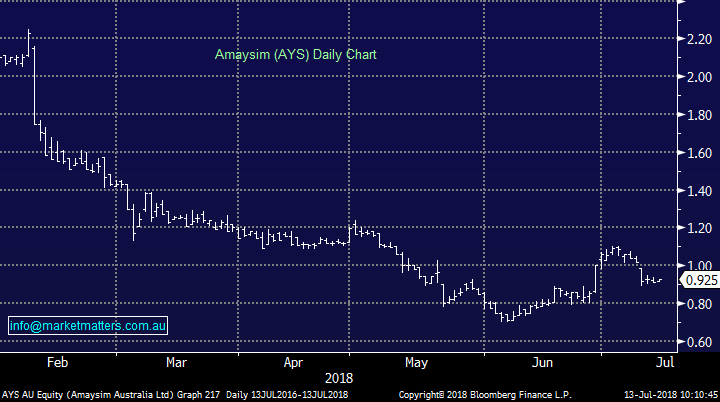 Offsetting the negativity to some degree has been ongoing speculation that Amaysim may be in the sites of a private equity bidder, although these rumours have done the rounds for some time. A negative outcome through the courts that leads to a sharp drop in the share price may just be the catalyst for a more patient private equity backer to snap up the Telco. Certainly one to keep on the radar. Market Matters write a straight talking, concise, twice daily note about our experiences, the stocks we like, the stocks we don’t, the themes that you should be across and the risks as we see them. Find out more.